By Donna R. Gore, M.A. "LadyJustice"
When television was in its infancy in the 1950’s, a show never to be missed was “The Honeymooners.” Ladyjustice was a young child and recalls the show to this day… However, in comparison to today’s “sophistication” and political correctness, this writer wonders how it achieved such popularity. Don’t say nostalgia, as if THAT can erase all past evil and chalk it up to, “It was an acceptable form of treatment between couples back then… “ When we apply what we know about domestic violence and intimate partner violence today, we should be horrified, shocked and dismayed at the treatment of women in the 1950’s and “wife as slave and one to be abused,” as portrayed in this classic comedy which all family members laughed at and looked forward to each week! Yes, Ladyjustice can take a joke…at things that are truly funny… A review of many YouTube episodes revealed some funny stuff between Jackie Gleason and his sidekick, Art Carney. However, the married couple relationship can be viewed as “toxic” as Susan Murphy Milano frequently describes…. In fact Susan probably watched these shows too, as her own father was playing it out in real life each and every day! Such shows give evil people evil ideas…. The character of Ralph Kramden is a know- it- all bus driver, who gets involved in one get rich quick scheme after another who loves to dominate and bully his wife. 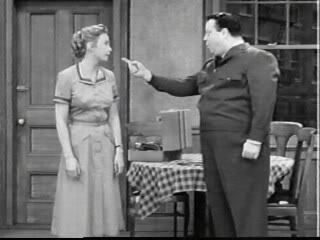 In fact, it appears that his friendship with best friend Norton is far more “intimate” regarding personal closeness and compatibility than his wife Alice, the begrudging housewife/slave who serves “The Master.” Alice Kramden is your typical ‘50’s housewife, BUT, she is no pushover. She frequently stands up to her husband’s verbal, physical and psychological abuse. Writers for Wikipedia attempt to “explain away” his bad behavior by saying, “Ralph is very short tempered, frequently resorting to bellowing insults and hollow threats.” Well hidden beneath the many layers of bluster, however, is a soft hearted man who loves his wife….and is devoted to his best pal, Ed Norton.” How can we be so sure of this, Ladyjustice asks? We have a very insecure male who is barely scraping by to provide a living for his wife…Who is not at all ambitious, with the exception of lifting a fork…. His world revolves around bowling and he doesn’t appear to care about bettering his situation in real meaningful ways…. And so, he finds fault with everyone else. How often has the character of Alice been frustrated, angry, in tears or wanted to run away from her apartment prison? Although we may not have seen blatant physical abuse, there was plenty of physical gesturing/threats, pounding on or throwing inanimate objects, screaming and verbal threats. Ralph’s mother in law constantly reminds him of his weight and that he is a bad provider to her daughter. The character of Alice apparently studied to be a secretary prior to marrying Ralph. According to the storyline, she was one of 12 children with a father who never worked. ‘Talk about lost dreams and toxicity for these two characters caught up in the life within a Brooklyn tenement! This series was supposed to mirror the working class of the 1950’s and the way Jackie Gleason grew up. But, were the comparatively speaking “innocent 1950’s” really so bad? Was the working class so angry? It appears to LadyJustice, that life in 2012 is a lot more complicated now, with far more sources of anger upon which the evildoers can blame their unacceptable and unlawful behavior…. 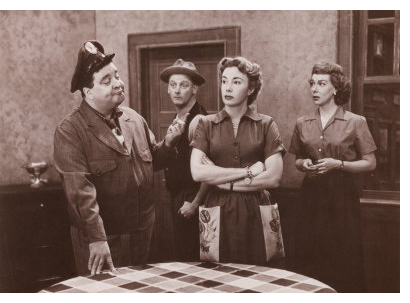 Historically, the start of the Honeymooners began as a six minute sketch on the DuMont Television Network and then as one of the featured sketches beginning in 1953 on the Jackie Gleason Show (a variety/comedy hour) moving to the CBS Network. The Gleason show was a rival for the ever popular, “I Love Lucy” show. Several actresses were considered for the Honeymooner’s co-staring wife role. However, some were blacklisted during the time of the McCarthy hearings. What an opportunity for Audrey Meadows… She sent Gleason her “wake up in the morning look” in a ripped housecoat when she was considered “too pretty” for the role. What out-of-the-box thinking! Jackie Gleason was paid a whopping $65,000 per episode increased to $70,000 during the second season. Audrey Meadows received $2,000 per week. Trixie’s character was Alice’s best friend. She has a rather nebulous persona. However, written accounts say she used to be a burlesque dancer (which she denied). Ladyjustice reviewed about a dozen episodes of the Honeymooners on YouTube. Although the viewer can make the case that Alice was very capable of “giving it back to Ralph” with biting sarcasm, what would be the consequence if she had not stood up for herself? ‘Perhaps even worse… Would Ralph eventually follow through with his gesture “to the Moon” and make contact? You betcha! On the other hand, being submissive and following an intimate partner’s demands to the letter in no way shape or form guarantees safety! So what’s a woman to do??? Anger and jealousy over “perceived infractions” will often continue to fuel the partner’s behavior. Alice does not have to do anything wrong in the eyes of the world. What Ralph perceives and does is what matters in the end with such toxic relationships.  They intentionally say things to embarrass you in front of others. They make remarks about your appearance or belittle you. They talk over you if you are engaged in conversation, or consistently contradict you in an effort to discredit you, or make you feel stupid.  They ignore you when you have “been bad”, or do not do as you are told. They act like you are not in the room. You are made to feel that you are invisible.  They withhold praise or affection. They make you feel that you’re mere presence disgusts them, that you are unattractive, and unworthy of them or anyone else.  You are made to feel worthless, no good, and stupid. You are told you’re your opinions do not count, that you couldn’t possibly have anything to say that anyone would want to hear.  They accuse you of having affairs, lying, or conspiring against them.  They use “those looks” or the inflection in their voice to illicit fear.  They disregard your personal space, or use posturing techniques to intensify your fear, therefore making it easier for them to exert their authority over you.  They destroy, or threaten to destroy your property; especially items that they feel have sentimental value to you.  They find fault in your friends and family and may even attempt to sabotage these relationships to further isolate you.  They limit your car activities by refusing to give you money for gas, pay for basic repairs, maintenance and upkeep or restrict your access to transportation.  They attempt to limit outside activities such as visiting family, getting involved with your children’s school, community functions, or attending religious services.  They dictate when and why you can leave the house, and make you account for your whereabouts at all times. The abuser can be a male or female. The abuser can be sweet, handsome and assuming to everyone, but you. An abuser knows exactly how to manipulate all types of situations. An abuser is the most generous and helpful person to the neighbor, your family, and friends. If you tell anyone you are being abused it is not likely you will be believed. When you are or were dating you thought it was “special” that this person was jealous of anyone who approached. Thinking how lucky you were until you moved in with them or married and the jealously turned into anger and rage, chances are you love this guy with all your heart and yet they still accuse you of having “secret affairs” or relationships with everyone else but, them. The abuser is very insecure. The abuser constantly questions your loyalty to them, the children and having a future together. The abuser hurts or destroys family pets. Jekyll and Hyde personality, they can be sweet one day and angry and violent the next. The abuser is clever at showing sincere intentions, but often has other motives. If you are pregnant, the abuser can become upset with you and angry and may attempt to make you miscarry. Once the child is born you may not be allowed to run and comfort your baby. An abuser expects the same attention and or sexual intimacy prior to the pregnancy. An abuser may be unusually rough or use measures of discipline far too extreme on your child. An abuser does not have the ability to love another person, is very critical of others. An abuser blames you for everything that goes wrong in their lives; their job, outside pressures, whatever it is, you are blamed. Regardless of the situation; it is always your fault. An abuser denies hurting you, almost acting like it never even happened. The abuser will make excuses for why they become angry or physically violent. The abuser blames their drug and alcohol abuse on you or their parents. The abuser believes in maintaining control over every aspect of their lives to the point of obsession, including monitoring activities of you and or the children. The Teeter Totter Abuser – remember when you were a child playing at the park? “I am leaving” to this is all “your fault” and beating you to “make you behave”. The next day they are rising you up high by apologizing, sending you flowers, a card. They may actually cry or beg you not to leave them. They say things like: “I am sorry”; “It will never happen again”; “Don't you understand how much I love you?” They bring you gifts, or suggest a romantic weekend away. Suddenly they act as if they worship the ground you walk on. Tarzan Abuser- their attitude and behavior is no different than “Me, Tarzan” (as they beat their chest) meaning they are superior to you, they are the “provider.” To “You, Jane” follow my lead, do as I say, be their slave, wait on their every desire, you are the invisible less important person in the relationship. An abuser has an important career in the public, people depend on them for answers, and the abusive person brings this attitude home with them. Parting Comments: Alice/Audrey Meadows: Audrey Meadows was a lot more savvy than Alice. She was the only actor on the series who requested financial compensation- residuals be written into her contract for the viewing of shows over time. In real life she served as Director of the First National Bank of Denver for 11 years – the first woman to hold such a position! She also was instrumental in the design of flight attendant uniforms and customer service policies at Continental Airlines (her late husband’s company). Smart woman!!! She protected her financial interests and was a pioneer career woman too! “Ralph” would have been so jealous! Please go to http://www.documenttheabuse.com/. It may help you… It will certainly help someone you know! To read more of Donna Gore's posts, and learn more about "LadyJustice," refer to her website: www.donnagore.com Donna is also a Featured Columnist for Here Women Talk. Sadly the justice system tends to side with these male domestic terrorists and make excuses for their behaviour. In Ireland- Catholic- married women victims are told by judges in court that women are supposed to know their place and obey- or the court will make them homeless and take the children. I would never believe this, had I not heard it with my own ears. Roll on a few years and I meet another victim in UK, whose abuser does all the things you mention above. The one that stands out is the accusation re victim being insane and his efforts to commit her, because she called police. He even managed to convince a judge that the 2 psychiatic reports saying the victim was not insane were Fake- now that is serious. If those on the bench can be institutionally groomed by domestic terrorists, then serious re education is needed. It got better, when this terrorist threatened to kill her and police did nothing.It is even on tape- yet nothing is being done. 2012 and collective conscious needs a serious awakening to this matter. First priority is to open these courts to the public and allow the media to report. Lady Portia: Thank you so much for the kind words and your insights on the status of intimate partner violence in the UK. The prevailing attitudes sound so medieval! I feel strongly that the content of Susan Murphy Milano's "Time's Up" book would absolutely apply in the UK. The use of the affidavit and video, I would hope could somehow be recognized by the Crown, even though you may have different hearsay and evidence rules. However, I am not an attorney, and am only "speculating in the wind" on this point. Perhaps an attorney you know or Susan herself could speak to this... I can't stress how important this material is for those abused worldwide! I will share this with her.... Kindly pass on this blog to others if you can! Respectfully, Donna "Ladyjustice"
I absolutely agree, many women are beaten down with abusive sarcasm, insults, and threats, and that often leads to physical abuse. Certainly by today's standards, the Honeymooners would be considered completely incorrect. For some reason, back then it worked and it seemed innocent. I haven't gone back and viewed the old Honeymooners videos, but my perception was always that Alice actually wore the pants in the family. She allowed Ralph to think he was boss. Ralph was actually afraid to let Alice find out about his stupid schemes and often hid things from her because he feared her reaction (at least that's what I remember). Either way, I agree, not a show for children to watch. Ralph’s all-bark-and-no-bite act is trumped only by Alice’s sarcasm and sharp tongue so it is no contest. 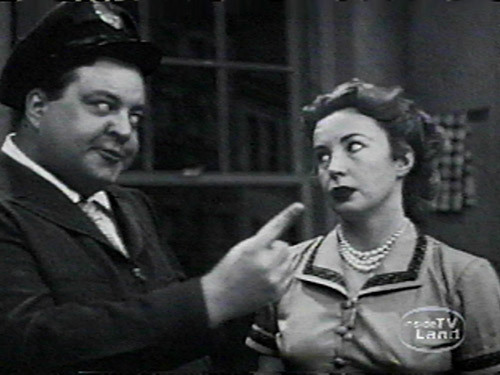 Ralph Kramden shouts, but Alice’s snide remarks speak far louder. Exactly what I was thinking! It's like Rochester on Jack Benny. He may say "sir"and "boss " but there is no doubt Rochester is completely in charge. Alice is in charge. Besides, it's just a TV show, after all. So because you believe it's "unhealthy" it's abusive? By that token Lucy and Ricky have an abusive relationship because he treats her like a child and often dexudes to teach her a lesson. They are just old shoes, for crying out loud. I think we should address real live issues rather than made up relationships from 60 -70 years ago! Well, for one, The Honeymooners was a TV show. It reflects the time it was produced. I, in no way, find that show to promote domestic violence. Ralph was just your average idiot who seemed to be afraid of his wife. From the acting itself,it seems like Alice wouldn't dare take Ralph being physically abusive to her. You're right, it wasn't politically correct, and that makes it great. "[Kramden] is not at all ambitious, with the exception of lifting a fork…. His world revolves around bowling and he doesn’t appear to care about bettering his situation in real meaningful ways." This is patently false. In fact, many episodes revolve around Kramden trying to better himself, and “bettering himself” almost invariably meant providing a better life for Alice. One episode that springs to mind is the very tender “A Dog’s Life,” in which Ralph believes he is going to die from arterial monochromia. Realizing, upon attempting to write his will, he has nothing to leave Alice, Ralph sells his story to a magazine and puts the money into an account in Alice’s name. Other episodes reveal that Kramden’s schemes are more often than not born out of his desire to furnish his beloved wife with furs, fashionable clothes, and, in at least one episode, the removal of a pesky bunion. While “physical gesturing/threats, pounding on or throwing inanimate objects, screaming and verbal threats” might reasonably scan as ‘red flags’ in real life, such behavior has long been integral to physical comedy dating back to Shakespeare. I notice you don’t mention the wanton physical violence of The Three Stooges, a comedy team who debuted a good quarter century before The Honeymooners aired. Is it because you believe that the actual onscreen depiction of male-on-male violence is unworthy of derision because it’s just…funnier? Not “some.” One: her name was Pert Kelton. Maybe instead of anachronistically criticizing a fictionalized television show from the fifties for not sharing your simpleminded, sanctimonious, and reactionary worldview, you might use your influence to address injustices done by real life people to real life people in real life. How about writing about the treatment of the aforementioned Pert Kelton, as well as countless other actors and actresses, at the hands of the HUAC? Side note: if you did even an itsy-bitsy bit of research beyond glancing at Wikipedia, you’d know that Kelton remained on Gleason’s Cavalcade of Stars through the program’s final season of the series despite the blacklist, largely due to Gleason’s influence, and his noncompliance with Red Scare hysteria. Your sarcasm, like much of your article, misses the point here. Prior to The Honeymooners, the still-green Meadows was almost exclusively cast in roles befitting a young, attractive woman. You miss an opportunity here to focus on Meadows’ resourcefulness here—which might have made a compelling thinkpiece about clever, shrewd women in Cold War Hollywood—instead choosing to myopically view Gleason’s rejection of her for the role as an attack on all womanhood. In fact, Gleason’s initial rejection of Meadows displays an (admittedly rare) showing of humility on his part: he was well aware who the monster was in this particular beauty and the beast dyad. The salary discrepancy you describe was (and is) quite common, with top-billed stars from Carol Burnett all the way up to Ellen DeGeneres frequently making ten times or more what other, equally qualified actors and actresses on the same show make. Lucille Ball, as early as 1968, was reported to be the richest woman in television, having earned an estimated $30 million. Her acting fees in 1966 were $130,172 an episode, which, by your own statistic, more than doubles Gleason’s just a decade earlier. Wow, twelve? By my calculation that totals a whopping 4 hours of The Honeymooners. Given the corpus--the perennially syndicated run known as the “Classic 39,” the hundreds of previously “lost episodes,” and Honeymooners skits performed by the cast on other programs, your four hours of “research” barely scratches the surface. Then again, surface appears to be your specialty. It is difficult to believe that this nonsense was written by a person with more than a fifth grade education. Of course you have a right to your opinion, but frankly, I’d be woefully embarrassed to have my name attached to such “scholarship,” given the reckless treatment of “facts” here. I hope that whatever institution awarded you your MA will, in the future, reconsider placing their recruitment ads in the Dingbat Gazette. How does it go from wife beating to talking about him providing for his wife and being ambitious? What do the two have to do with each other? What, if he was more ambitious and provided better for his wife then his abusive behavior would be acceptable? Picking on the Honeymooners? Alice was Ralph's master and she knew it, that couldn't be clearer in every episode. I feel sorry for your trauma.